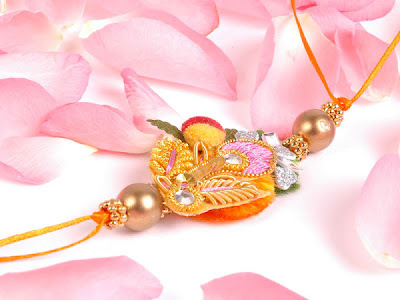 Raksha bandhan is the festival of brother & sister. According to Gujarati month Raksha bandhan comes on a ‘Shravan Sud Purnima’. On this day sister tie Rakhi on brother’s wrist. Hindus and Sikhs are mostly celebrating this festival. In several parts of India it is also called as Rakhi Purnima. And sister wishes to god for her brother’s always wellbeing & for his healthy, wealthy & prosperous life. Brother also take oath inside his heart to always take care or protect his sister from all the bad situation, & he also promises that he will always stand by her, in her god or also in bad. In early morning sister tie Rakhi to her brother & also feed the sweet to each other, like their sweet relation. And in return brother give gift to his sister gifts like envelop with full of money, and may be any other kind of gift. And also sweets like Jalebi, kajukatri, petha, & dryfruits, Burfi. This festival is continuous from the ancient time relation like with God & Godesses Santoshi ma with Ganesh ji, Krishna & Draupadi, King Bali and Goddess Laxmi, Yama and the Yamuna they also celebrated this festival on their own way by proving their presence in needy time. Now a days there are so many different variety of rakhis are available in the market of different material, which are very attractive. Aa gaya hai “RAKSHA BANDHAN” ka tyohar! Aur tujhe behen ka pyaar mile!! and best of luck for every thing!